The best way to understand the Synchronize APIs is to create a simple example that actually works. In this example we will be creating a page in the Synchronize View that will display the latest local history state for all files in the workspace. The local history synchronization will update automatically when changes are made to the workspace, and a compare editor can open to browse, merge, then changes. We will also add a custom decorator to show the last timestamp of the local history element and an action to revert the workspace files to their latest saved local history state. This is an excellent example because we already have a store of resource variants available and we don't have to manage it. For the remainder of this example we will make use of a running example. Much, but not all, of the source code will be included on this page. 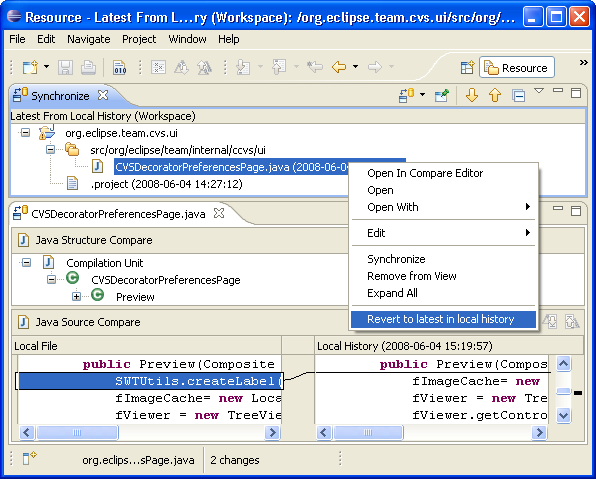 The full source code can be found in the local history package of the org.eclipse.team.examples.filesystem plug-in. You can check the project out from the CVS repository and use it as a reference while you are reading this tutorial. Disclaimer: The source code in the example plug-ins may change over time. To get a copy that matches what is used in this example, you can check out the project using the 3.3.2 version tag (most likely R3_3_2) or a date tag of June 10, 2007. This screen shot shows the local history synchronization in the Synchronize View. With it you can browse the changes between the local resource and the latest state in history. It has a custom decorator for displaying the timestamp associated with the local history entry and a custom action to revert your file to the contents in the local history. Notice also that the standard Synchronize View presentation is used which provide problem annotations, compressed folder layout, and navigation buttons. The first step is to define a variant to represent the elements from local history. This will allow the synchronize APIs to access the contents from the local history so it can be compared with the current contents and displayed to the user. Since the IFileState interface already provides access to the contents of the file from local history (i.e. implements the IStorage interface), this was easy. Generally, when creating a variant you have to provide a way of accessing the content, a content identifier that will be displayed to the user to identify this variant, and a name. The asBytes() method is only required if persisting the variant between sessions. Next, let's create a variant comparator that allows the SyncInfo calculation to compare local resources with their variants. Again, this is easy because the existence of a local history state implies that the content of the local history state differs from the current contents of the file. This is because the specification for local history says that it won't create a local history state if the file hasn't changed. Because we know that the existence of the local history state implies that it is different from the local, we can simply return false when comparing the file to its local history state. Also, synchronization with the local history is only two-way because we don't have access to a base resource so the method for comparing two resource variants is not used. Note that the synchronize calculation won't call the compare method of the comparator if the variant doesn't exist (i.e. is null). It is only called if both elements exist. In our example, this would occur both for files that don't have a local history and for all folders (which never have a local history). To deal with this, we need to define our own subclass of SyncInfo in order to modify the calculated synchronization state for these cases. We have overridden the constructor to always provide a base that is null (since we are only using two-way comparison) and we have modified the synchronization kind calculation to return IN_SYNC if there is no remote (since we only care about the cases where there is a local file and a file state in the local history. Now we will create a Subscriber that will provide access to the resource variants in the local history. Since local history can be saved for any file in the workspace, the local history Subscriber will supervise every resource and the set of roots will be all projects in the workspace. Also, there is no need to provide the ability to refresh the subscriber since the local history changes only when the contents of a local file changes. Therefore, we can update our state whenever a resource delta occurs. That leaves only two interesting method on our local history subscriber: obtaining a SyncInfo and traversing the workspace. The Subscriber will return a new SyncInfo instance that will contain the latest state of the file in local history. The SyncInfo is created with a local history variant for the remote element. For projects, folders and files with no local history, no remote resource variant is provided, which will result in the resource being considered in-sync due to the calculateKind method in our LocalHistorySyncInfo. The interesting detail of this method is that it will return non-existing children if a deleted resource has local history. This will allow our Subscriber to return SyncInfo for elements that only exist in local history and are no longer in the workspace. Next we have to implement the LocalHistoryParticipant. It will subclass SubscriberParticipant which will provide all the default behavior for collecting SyncInfo from the subscriber and updating sync states when workspace changes occur. In addition, we will add an action to revert the workspace resources to the latest in local history. First, we will look at how a custom action is added to the participant. Here we are adding a specific SynchronizeMoidelAction and operation. The behavior we get for free here is the ability to run in the background and show busy status for the nodes that are being worked on. The action reverts all resources in the workspace to their latest state in local history. The action is added by adding an action contribution to the participants configuration. The configuration is used to describe the properties used to build the participant page that will display the actual synchronize UI. Now lets look at how we can provide a custom decoration. The last line of the above method registers the following decorator with the page's configuration. The decorator extracts the resource from the model element that appears in the synchronize view and appends the content identifier of the local history resource variant to the text label that appears in the view. description="Synchronize resources with their previous contents in the local history"
name="Synchronize with Latest From Local History"
This will add our wizard to the list and in the wizards performFinish() method we will simply create our participant and add it to the synchronize manager. This is a simple example of using the synchronize APIs and we have glossed over some of the details in order to make the example easier to understand. Writing responsive and accurate synchronization support is non-trivial, the hardest part being the management of synchronization information and the notification of synchronization state changes. The user interface, if the one associated with SubscriberParticipants is adequate, is the easy part once the Subscriber implementation is complete. For more examples please refer to the org.eclipse.team.example.filesystem plug-in and browse the subclasses in the workspace of Subscriber and ISynchronizeParticipant. The next section describes some class and interfaces that can help you write a Subscriber from scratch including how to cache synchronization states between workbench sessions.